Special Counsel Robert Mueller has added charges for obstruction of justice to the indictment of Paul Manafort on Friday. The indictment states that Manafort and his associate Konstantin Kilimnik “knowingly and intentionally attempted to corruptly persuade” two unnamed witnesses “with intent to influence, delay, and prevent the testimony.” It doesn’t mention any further details. It also adds a charge for conspiracy to obstruct justice, meaning Manafort and Kilimnik allegedly did it together. Mueller previously charged Manafort in two separate lawsuits with conspiring to launder money, lying to investigators, committing tax and bank fraud, and failing to register as a foreign agent. The charges stemmed from his PR and campaign work for former pro-Russian Ukrainian president Viktor Yanukovych. Kilimnik, described as a former Russian intelligence officer, worked with Manafort on the Yanukovych job. 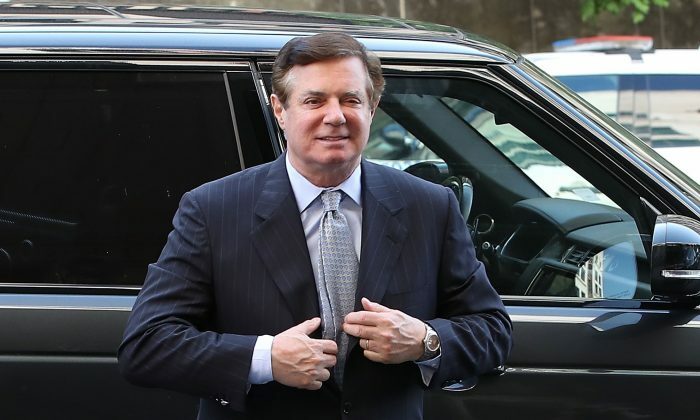 Years after his work for Yanukovych ended, Manafort joined the campaign of then-candidate Donald Trump in March 2016 and served briefly as the campaign manager from June to August that year. He stepped down amid reports of his previous work in Ukraine. Trump later questioned why the FBI never told him Manafort was being investigated for his past business. “We should have been told that [then-FBI Director James] Comey and the boys were doing a number on him, and he wouldn’t have been hired!” Trump wrote on Twitter on June 3. None of the charges against Manafort are related to Russian interference in the 2016 elections or any collusion between the Trump campaign and Russia, which Mueller was originally appointed to investigate. Manafort pleaded not guilty and is fighting the charges in court. The judge in Manafort’s case rebuked Mueller’s team during a hearing in early May, saying that the prosecutors are more interested in taking down Trump than securing a conviction against Manafort. Ellis demanded to view a classified “scope memo” sent to Mueller by Deputy Attorney General Rod Rosenstein, which outlines what the special counsel is authorized to probe. The judge demanded to see the memo because the charges brought against Manafort are well outside the scope of the Russia probe. Manafort was one of at least seven of Trump’s associates secretly surveilled by the Obama administration. He was spied on from sometime in 2016 to early 2017, including times when he spoke to Trump, according to leaks to the media from anonymous sources. The Epoch Times previously laid out how a select group of Obama-administration officials orchestrated an expansive spy operation against the Trump campaign that included national security letters—a type of secret subpoena—Foreign Intelligence Surveillance Act (FISA) warrants, at least one spy, the unmasking of American citizens in intelligence reports, and spying conducted by foreign intelligence agencies. A large amount of information obtained through the operation was illegally leaked to certain media. Both the Department of Justice (DOJ) inspector general and the House intelligence committee are currently probing the officials involved and why they launched the operation. A group of congressmen already referred former FBI Director James Comey, former FBI Deputy Director Andrew McCabe, former Acting Attorney General Sally Yates, and former Acting Deputy Attorney General Dana Boente for criminal investigation over their roles in signing a FISA warrant to surveil Trump campaign volunteer adviser Carter Page. The FBI wiretapped Page using a warrant based on an unverified dossier funded by Hillary Clinton’s campaign. The lawmakers accuse the four officials of depriving Page of his rights and of investigative misconduct. Mueller and his team took over the FBI investigation in May 2017. Of his team of 17 lawyers, most worked at the DOJ or FBI headquarters during the Obama administration. At least 13 are registered Democrats, and at least 11 of them made campaign contributions to Democratic candidates, The Daily Caller reported. None are Republican except, perhaps, Mueller himself.